CALENDAR OF EVENTS! WELCOME TO THE BMC! May 4 : Don Miller Mud Run. June 1 : La Crosse County Ride. May 18 : Road America. June 15 : Holiday Motors Ride. July 13 : Bergstrom Mazda Ride. August 2-4 : IMS Sports car challenge at Road America. August 10 & 11 : Autobahn Hyperdrive. August 11-13 : Buffalo Stampede. September 21 : Mississippi Ride. October : Chili Ride and Picnic. October 19 : Sauk City Ride. November 2 : Annual meeting. Here's where you will find information on Autocross, The Sports Car Club of America (SCCA) Road Rallies, High Speed Performance Events, etc.! September 24-27, 2020: Buggies and Bridges III, Miatas return to Amish country! Signs of Spring and Other Ramblings. Unfortunately, due to a prior commitment, I ended up missing one of my favorite late winter treats, Tom and Mary Lynn's "Fat Tuesday" celebrations. I heard they put on their usual great celebration so congratulations for another fantastic event. I saw a Miata on the road the other day. Poor thing was full of winter goo. However, I did see my first sign of spring on my way home from work on Friday. The orange barrels are sprouting on the side of the freeway. It's getting closer and soon we will be able to get our little buddies out of hibernation. Time for the spring tune-ups, fluid changes, bleed the brakes, make sure the belts and hoses are good, remove all small mammal deterrents, insure all suspension parts are tight and in good shape, and so on. I may be a little picky in this department but my car doubles as my weekend track toy. Saturday May 4, 2019 is the opening drive of the season. The Don Miller Mazda "Mud Run" so join us for what is surely going to be a great season opener. Saturday May 18, 2019 I will again be leading a group to Road America for the SVRA "Spring Vintage Festival" including the Miata heritage race. We will be leaving from Menomonee Falls on a nice twisty playful drive to the race track where we will not only watch the races we will be also be doing a track tour. This year we are planning on grilling out at the track after the track tour so join us if you can. There will be more information coming up on the web page soon. 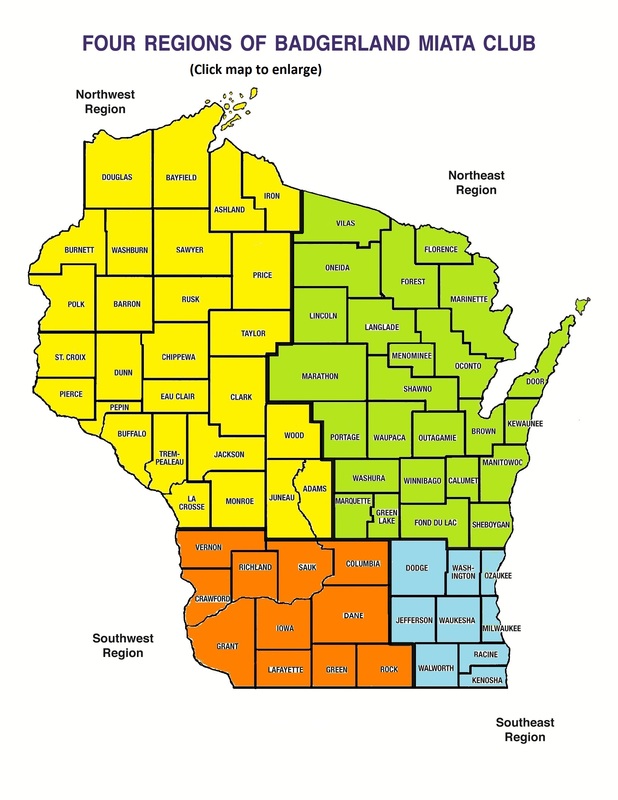 Saturday May 18,2019, you can also join the group the same day for the La Crosse County drive and there will soon be more information on that drive. Well, it’s been an interesting week. NO, NOT A SNOWSTORM THIS YEAR. We have just found out that Don Miller Mazda will no longer be a Mazda Dealer effective May 1, 2019. Unfortunately for us, it means we can not meet there this year. We are trying to negotiate with Russ Darrow Mazda in Madison to see if they are interested in working with BMC for next year. They just had a big change there in management, so it will take some time. We are still doing the Mud Run on May 4th, but the ride has changed. See the Calendar of Events for all the new ride information. What could be better on a frigid February night in Milwaukee than meeting up at a warm German Bier Haus and sharing stories, drinks and dinner with a great group of Miata buddies? 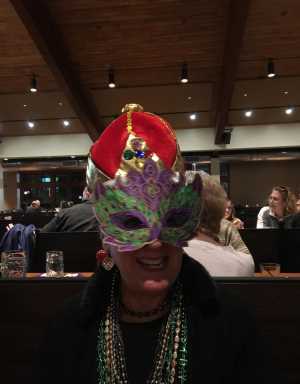 Well, that's exactly what a bunch of us did to celebrate Fat Tuesday, German style. Tom and Mary Lynn Cinealis organized a great evening at the Bavarian Bier Haus which provided an excellent venue for food and friendship. The food we enjoyed ranged from sizzling ribeye steak, roasted chicken, Wiener schnitzel, Polish Pierogi and more. As a finishing touch, we ate an ethnic cake decorated with green, purple and yellow icing and embedded with a tiny baby doll, which ensures a year of good fortune and happiness. Tom Cinealis was the lucky recipient of that good omen. We all wore festive masks ranging from Phantom of the Opera style, to Medieval Italian Bird style, to pretty lace and feather styles. Very cool! And the beads! Tres chic! Or rather... Wunderbar!! 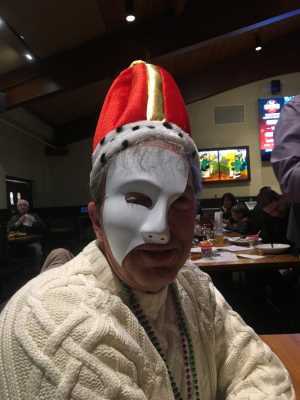 To fairly judge the best masks to qualify for King and Queen, some youngsters were drafted to make the decision, and the grateful winners were Webmaster, Ron Staub for King and Patty Kobus for Queen. Both were awarded elegant red velvet crowns which will be proudly worn at the first Miata drive in May. Look for them and make sure to congratulate and honor the proud King and Queen. Many thanks to the Cinealis' for organizing this event and to all our friends for making it a really nice evening. Tom Boll passed away on March 20th. There will be a memorial service for him on April 6th. His obituary is listed here. Anyone wanting to send cards can contact me for their home address. * Replacement Badgerland Miata Club Badges. If anyone needs a new name badge for the Badgerlandmiata Club you should contact Jim Hotz at treasurer@badgerlandmiataclub.com . The cost for a replacement badge is $5.00. * Do not use Facebook to register for an event. Contact the event host via the contact link in the event description. * Miata maintainance questions? Check with our Tech Advisers. Share your event photos. Create a link to your photos that can be included with event updates. this information. The ideas, opinions, maintenance or modification tips expressed are to be used at the reader's discretion. to a member resulting from membership in this club. All articles and content are subject to editing. All pages & copy; 2004 - 2019 Badgerland Miata Club, Inc.